Our only issue with Hurricane Irene is our current no power status. And, who knows when it will be back on. Post-earthquake I stocked up on water, snacks and food that did not require heating or cooling (i.e. bread and peanut butter) to prepare for the strong possibility that we would not have power. When we get five mile per hour winds the power goes of so I knew Irene would down our power source. 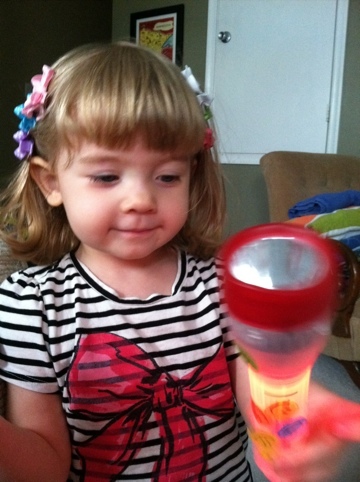 Miss H loves playing with the flashlights so this no power thing is pure fun. Plus, Target was open so we stocked up on fresh Play Dough, new shoes and hair bows. Miss H has never ever worn anything in her hair but ever since getting her haircut yesterday, they are a must accessory. Six to be exact. Hope everyone is safe! More to come later!